-Marshall McLuhan, The Medium is the Massage. As industries provide artists with newer technologies of expression, one risks losing the message in the medium. The novelty of medium continues to influence much of contemporary art, leading some artists to rely on interactivity. McLuhan described our Age of Anxiety as the “blurring of technology and society.” It’s in our need to humanize technology where McLuhan’s anxiety lies. 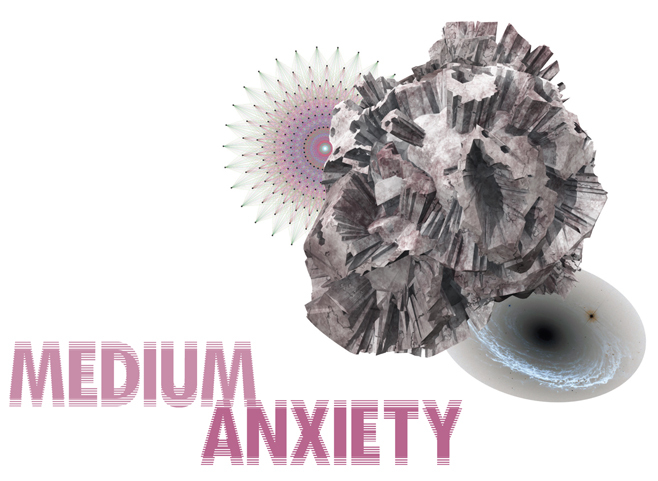 Medium Anxiety is the work of seven artists using a variety of media to explore and recreate experience. Pascual Sisto (Los Angeles, CA) uses video effects in city-space and suburban landscapes creating unrealities. Fred Muram (Chicago, IL) works similarly by recreating fantastic moments presented as mundane, everyday occurrences. Bob Snead (New Orleans, LA) recreated his frustration from a bad Craigslist purchase after buying a used industrial sewing machine that quickly broke. He transferred its uselessness into the medium it could no longer produce and threw it out of his window. Thomas Gokey (Syracuse, NY) recreated the experience of crying by injecting himself with a 5mg dose of oxytocin as a performance and as analyzed data. Toby Kaufmann-Buhler (Madison, WI) uses video and sound to juxtapose the documentation of lived experience in order to explore the boundaries of place and space. 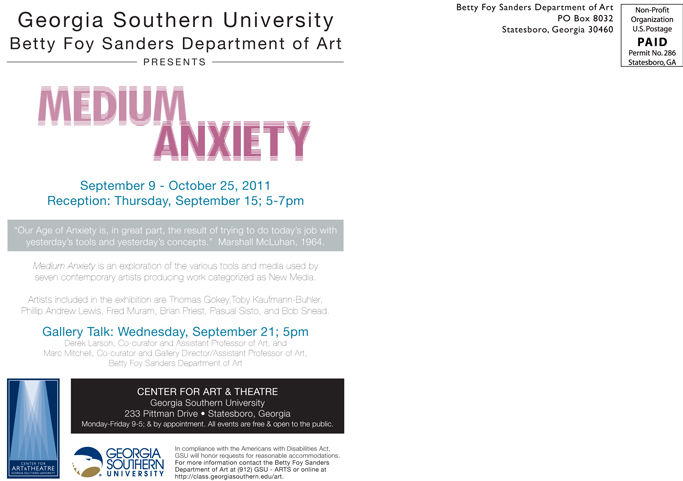 Phillip Andrew Lewis (Chattanooga, TN) transforms serene elements of the landscape into meditative experiences on film. Brian Priest (Indianapolis, IN) displays micro-realities with platforms made from images of enlarged grains of sand below hanging sound units, allowing viewers to imagine consciousness on a vastly different scale.